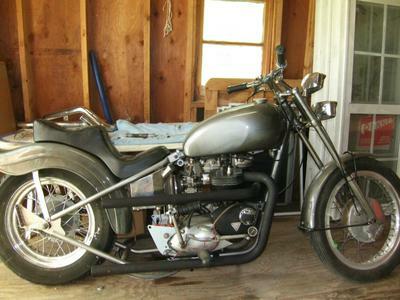 I bought this 1968 Triumph Tiger in 1990. I rescued it. It had been in his barn since late late 68 to early 69. 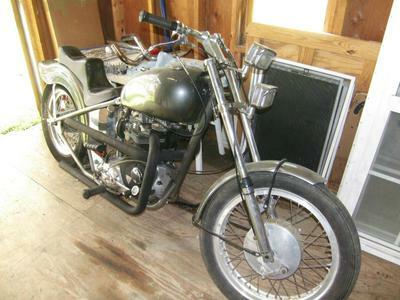 I was told it was a Bonneville but when he brought it in to me it only had one had carb. I looked it over and told him he was mistaken and then looked at the numbers and its TR6R. He told me he didn't know a lot about triumphs. So I paid him his $75 and took her home. She was rough, dirt was six inches up the rim. Boys I'll tell ya the paint job a drug induced one. Don't get me wrong it was good looking but it was the old metal flake, with the huge flakes, it had the old thanksgiving horn with little stars, moons in it. It had ghost scallops on the side panels. It must of had ten coats of paint because it was more than one-sixteenth of an inch thick. I stripped everything off except the engine and front frame section. I wanted a longer wheel base so I got a six over tail section, a 16 inch rear wheel, and kept the stock tank except I took the belly rack off. I went through some hard times so she sat in the garage for what seemed like forever. Two years ago I pulled her out and knocked off the cob webs off her. I found a belt drive for it. The only problem I found was they didn't make a shroud for it. I didn't let that slow me down. I cut out two by twelve the shape of my primary cover and took a two inch piece of spring steel screwed it to the board and took rubber mallet and pounded it around the outside screwed it down, left it for two months, and when I pulled it off it had formed to the shape of the primary. At the time I found some quarter inch loomed stainless steel aggregate screen for outer primary cover. 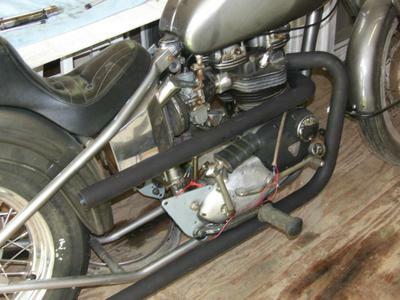 She's not done, I've got a set of forward controls and front end from an early sporty that goes on next. The Triumph Tiger had a long history. It began as the Tiger 100 series in about 1935 I believe. They sold very well for many years, and ultimately they transitioned from Tiger's to Daytona's which were 500cc. 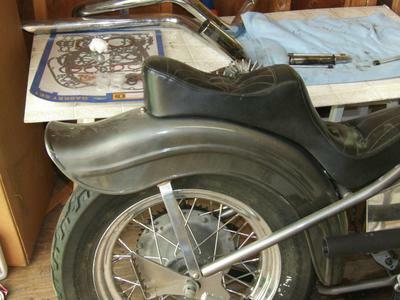 The Daytona/Tiger motorcycle ended manufacturing in 1973. However, twenty years later, in 1993 Hinkley Triumph created a Tiger and they had a six year run.